The demands of the race are similar to that of the 800 metres, but with a slightly higher emphasis on aerobic endurance and a slightly lower sprint speed requirement. The 1500 metre race is predominantly aerobic, but anaerobic conditioning is also required. Each lap run during the world-record race run by Hicham El Guerrouj of Morocco in 1998 in Rome, Italy averaged just under 55 seconds (or under 13.8 seconds per 100 metres). 1,500 metres is three and three-quarter laps around a 400-metre track. During the 1970s and 1980s this race was dominated by British runners, along with an occasional Finn, American, or New Zealander, but through the 1990s a large number of African runners began to take over in being the masters of this race, with runners from Kenya, Morocco, and Algeria winning the Olympic gold medals. Many 1500 metres events, particularly at the championship level, turn into slow, strategic races, with the pace quickening and competitors jockeying for position in the final lap to settle the race in a final sprint. Such is the difficulty of maintaining the pace throughout the duration of the event, most records are set in planned races led by pacemakers who sacrifice their opportunity to win by leading the early laps at a fast pace before dropping out. Hicham El Guerrouj also ran 3:26.12 (2001), 3:26.89 (2002), 3:27.21 (2000), 3:27.64 (2004), 3:27.65 (1999). Bernard Lagat also ran 3:27.40 (2004), 3:27.91 (2002). Asbel Kiprop also ran 3:27.72 (2013). Genzebe Dibaba also ran 3:54.11 (2015), 3:55.17i (2014). Tatyana Kazankina also ran 3:55.0 (1980). Lixin Lan also ran 3:55.01 (1997). Yunxia Qu also ran 3:55.38 (1997). Zhang Ling also ran 3:55.47 (1997). 1,500 metres is also an event in swimming and speed skating. The world records for the distance in swimming for men are 14:31.02 (swum in a 50-metre pool) by Sun Yang, 14:08.06 (swum in a 25-metre pool) by Gregorio Paltrinieri; and by women 15:25.48 (swum in a 50-metre pool) by Katie Ledecky, and 15:19.71 (swum in a 25-metre pool) by Mireia Belmonte García. The world records for the distance in speed skating are 1:41.04 by Shani Davis and 1:50.85 by Heather Richardson-Bergsma. ^ 1500 m - Introduction. IAAF. Retrieved on 2012-02-07. ^ "IAAF: 100 Metres - men - senior - outdoor - 2018 - iaaf.org". iaaf.org. ^ "Scandal as controversial Chinese athlete Wang Junxia enters IAAF Hall of Fame". The Daily Telegraph. London. 9 March 2012. ^ "Athletics world records blow as Wang Junxia 'admits' being part of Chinese state-sponsored doping regime". Retrieved 2016-08-13. ^ McCune R. R. (2011-07-11). Verzbicas Breaks Four. Lets Run. Retrieved on 2012-02-07. ^ "Bayi's record may be gone but it should never be forgotten". HeraldScotland. ^ "All-time men's best 1500m". alltime-athletics.com. 26 July 2018. Retrieved 1 August 2018. ^ a b "1500m Results" (PDF). sportresult.com. 17 July 2015. Archived from the original (PDF) on 5 March 2016. Retrieved 18 July 2015. ^ "1500m Results" (PDF). sportresult.com. 20 July 2018. Retrieved 1 August 2018. ^ "1500m Results" (PDF). sportresult.com. 17 July 2015. Archived from the original (PDF) on 5 March 2016. Retrieved 18 July 2015. ^ Mike Rowbottom (19 July 2013). "Seven world leads on magical night in Monaco – IAAF Diamond League". IAAF. Retrieved 21 July 2013. ^ "IAAF Diamond League - 1500m Results". www.diamondleague-monaco.com. 18 July 2014. Archived from the original on 21 July 2014. Retrieved 19 July 2014. ^ "1500m Results". IAAF. 14 June 2009. Retrieved 7 December 2015. ^ All time Women's 1500 metres. IAAF. Retrieved on 2012-02-07. ^ a b c "IAAF Diamond League Monaco - 1500m Results" (PDF). sportresult.com. 17 July 2015. Retrieved 18 July 2015. ^ "Prefontaine Classic 2016 Results". tilastopaja.org. 28 May 2016. Retrieved 28 May 2016. ^ "Turkey's Asli Cakir Alptekin stripped of Olympic 1500m title for doping". The Guardian. 17 August 2015. ^ Mariem Alaoui Selsouli was banned from The Olympic games 2012 in London after testing positive for the diuretic furosemide, following her competition in Diamond League July 6, 2012 in Paris-Saint-Denis, with the result 3:56.15 min. ^ Mulvenney, Nick (25 July 2012). "UPDATE 1-Olympics-Athletics-Moroccan Selsouli tests positive". Reuters. ^ "Katie Ledecky Chops 2 Seconds Off 1500 Free World Record at 2015 FINA World Championships". swimmingworldmagazine.com. 4 August 2015. ^ "Current Speedskating World Records". Archived from the original on 2009-10-19. 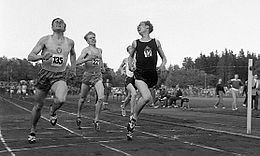 Wikimedia Commons has media related to 1500 metres. This page was last edited on 12 March 2019, at 16:54 (UTC).